Becoming a beauty blogger and watching my interest in beauty and skincare grow, only recently I've realised the true importance of cleansers and toners and just how effective and beneficial they are to my skin. In case you didn't know, using soap on your face actually dries it out and alters the pH of the skin - you may have noticed your skin tightening up after using soap on your face. It also breaks down the naturally acidic protective layer on our skin, which is there to fight against viruses and bacteria. Using a cleanser is pretty much a far more gentle version of soap which opens up your skin pores to remove any excess dirt, perspiration and oil that may have gathered on your face. Cleaners also allow your skin to absorb more nutrients through the pores, resulting in naturally healthier and prettier skin. Replace any soaps with cleanser and you're already on the road to skin heaven. Toning your skin is just as important and goes hand in hand with cleansing. Although cleansing is essential, and much better than cleaning your skin with a soap bar, it also removes our skins natural protective layer, leaving us vulnerable to bacteria build up (resulting in spots). Using a toner will close up the skin pores that have just been opened, and also removes any excess dirt left over from cleansing. A toner aims to restore the balance of pH in your skin that has been previously adjusted by soaps/washes/cleansing and to nourish and refresh the skin. Adding cleansing and toning into your daily skincare routine will leave your skin feeling and looking brighter and healthier. 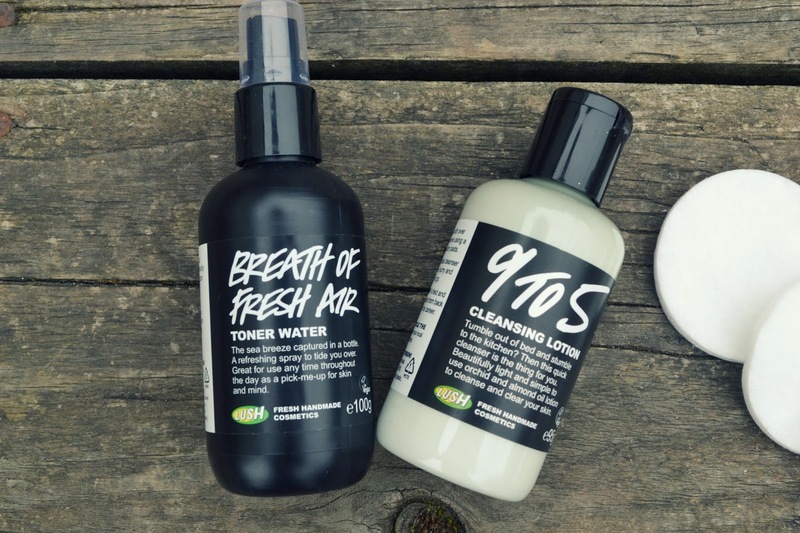 My favourite cleanser and toner is from Lush and always leaves my skin feeling fresh and clean after use. There are lots of different cleansers and toners for different skin types so you should always be careful when buying them and check that they are suitable for your skin. I have never suffered from oily or combination skin so I stay away from ones that specialise in oily skin and choose ones that hydrate and moisturise. To cleanse, I use the 9 To 5 Cleansing Lotion which uses almond oil and dove orchid cleansing milk to help moisturise and hydrate. The cleanser is super soft and light on your skin and, as with any Lush product, smells amazing. I apply the cleanser to my face with my finger tips, using circular movements to stimulate skin cells. I then remove the cleanser off my face using cotton wool pads. This cleanser is perfect for those who don't have much time for their daily skin routines - you simply apply it on and then take it off! To tone my skin, I use the Breath Of Fresh Air Toner Water - a cool refreshing toner that will most likely end up being my summer handbag essential. I simply spritz it onto cotton wool pads and apply it to my face. The beauty of this little toner is that it can also be used to freshen up and cool down your skin, as well as closing pores and removing dirt. ...And there you have it. Cleanse and tone and your skin will thank you by looking glowy and pretty! What do you use to cleanse and tone? I've only recently ventured into their skincare, but it's really good! I love lush' skincare range. I haven't used either of these products, but swear by the moisturisers and face masks! I've never tried the moisturisers or face masks - they're on my list though! Ooh I've never tried the Aqua Marina cleanser, I'll have to give it a go. I need to try out more too - these are my first Lush skincare purchases! 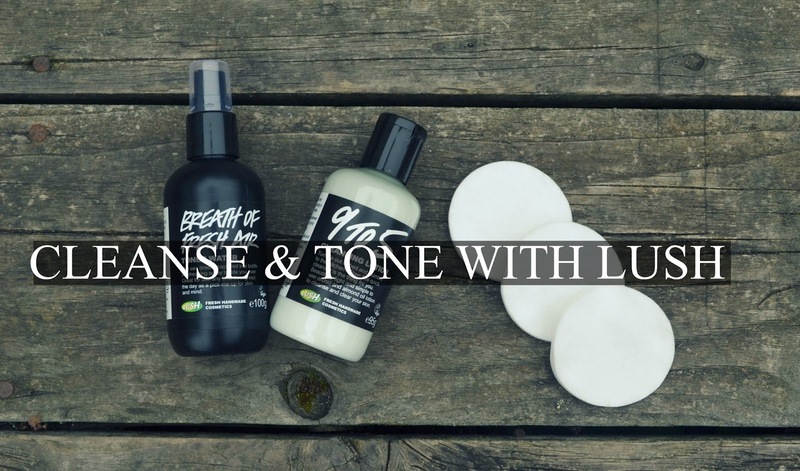 I love Lush, I'm awful with cleansing and toning but it is something I should try and do everyday but with two small children I'm lucky if I get a shower in the morning. I'll take a look at these when I'm next in store. I'm trying to make myself do it more too! Aww, busy morning routines always make it hard to cleanse and tone, my mum says she'd never have the time to do it! I love toner esp when your lazy to remove your makeup! This product is a thumbs up! Yes toner is perfect for that!! Lush make some great products. I have used their bath bombs and shampoo since they were Cosmetics To Go all those years ago. I always cleanses and tone! I've never try anything from Lush. This sounds pretty good. You should give it a go, the products are natural and organic! I've only tried Lush bath bombs but never their skincare range. These sounds really good and I'll be picking up the toner to try soon. It's always best to go with what suits you and your skin :) As long as soap is followed my moisturiser it shouldn't cause your skin too much dehydration! Lush's mask of magnaminty and their lip scrubs are hands down my favourite things of life. Lush is such a great brand. I love their cleanser and toner too. And I'm currently trying out their other products. Bath bombs are always good ones to try - they're amazing!